What's the secret to keeping a potato salad light and low-calorie? Less mayo and more fresh herbs to carry the flavor; in this case, fresh dill! 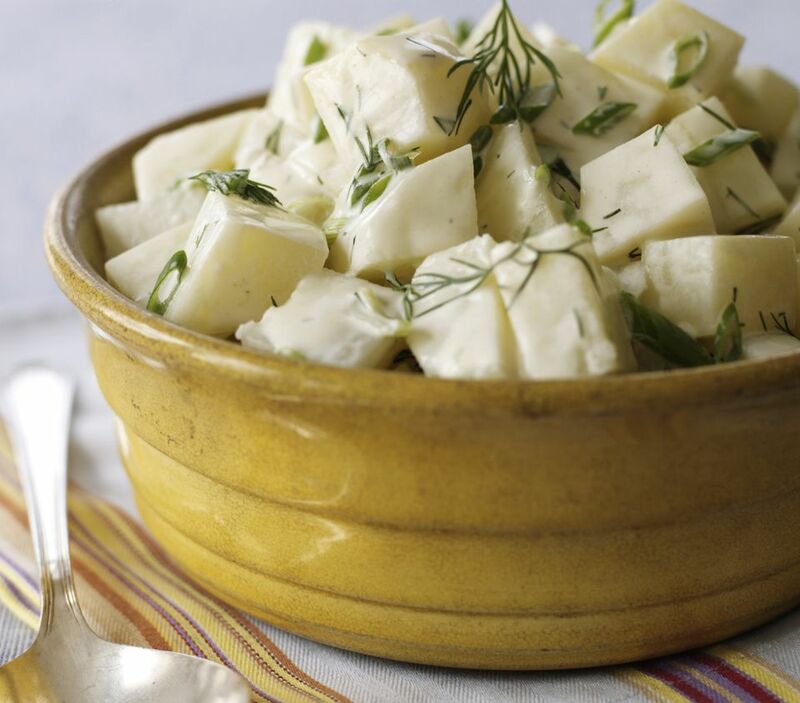 Looking for a light potato salad recipe? Try this one. You can always reduce the amount of mayonnaise in your favorite potato salad recipe, use a light mayonnaise, or, if you haven't already, try a vegan mayonnaise for a lighter meal. Another option? Try a mayonnaise-free potato salad recipe, such as this easy vegan potato salad with peas and kale, or, for something a bit different, try a grilled potato salad! This vegan German-style potato salad is another low-fat option. Or, for a reduced-fat potato salad, this recipe below is perfect. It still packs that satisfying and traditional creamy texture by including mayonnaise, but reduces the amount, and compensates for the reduced mayonnaise with other fresh flavors, including fresh chopped dill, apple cider vinegar, lemon and Dijon mustard. The recipe calls for 2/3 cup mayonnaise, but you can always add a little less, or, add it in gradually to see how much you think you need in order to further reduce the amount of fat and calories. If you'd like a bit of crunch in your potato salad, you could always add in a few spoonfuls of vegetarian bacon bits as well. Keep this recipe vegan and cholesterol-free by using a vegan mayonnaise substitute. Scrub your potatoes, and peel them if you'd like (I usually don't bother because I personally don't mind the skin, but up to you). Then, chop into bite-sized chunks, about one inch. Place the potatoes in a large pot of water and bring to a boil. For the best flavor, you'll want to heavily salt the water, but it's a personal preference. Boil the potatoes just until they're tender. Check after about 8 minutes, and they should be done after no more than 12 - 15 minutes. Drain and allow to fully cool. While your potatoes are cooling, whisk together the mayonnaise, apple cider vinegar, lemon juice and Dijon mustard. In a large bowl, place the cooled potatoes and gently toss with the celery and fresh dill to combine (and any other optional ingredients you like, such as chopped chives, green onions, chopped hard boiled eggs, black olives, sweet pickle relish, vegetarian bacon bits, etc.). Finally, gently toss the potatoes with the mayonnaise dressing, just until potatoes are well coated. Season lightly with salt and pepper, to taste. Serve your homemade potato salad cold, and, if you have time, best to let it chill in the fridge for at least an hour (or overnight, if possible!) to let the flavors fully develop.